Cast: Will Ferrell, John C Reilly, Gary Cole, Michael Clarke Duncan, Sacha Baron Cohen. Running Time: 1hr 48 minutes. Talladega Nights is nothing more than a Will Ferrell vehicle - but it's a good one. If goofy and slapstick humour drives your engine, step up to pole position and prepare for a raucous ride. Ferrell is Ricky Bobby, top flight NASCAR driver with the world at his feet. That is, until cheeky French upstart Jean Girard (Sacha Baron Cohen - Ali G to you and me) turns up on the scene and upsets the apple cart. What follows doesn't really matter, it's the daftness with which it gets there that's important. Ferrell's on top form with such hilarious lines as, "yep, I'm flyin' through the air. It's not good," while Cohen's ludicrous French accent fits the farce nicely. John C Reilly leaves the comfort of serious acting to play Ferrell's brotherly sidekick and the movie is all the better for it. Nobody takes anything seriously, as the outtake reel on the credits ably demonstrates, and there are plenty enough laughs to keep the easily amused (e.g. me) chuckling until the very end. Talladega Nights is great fun, in the typical Will Ferrell brainless kind of way. Unless you couldn't stand his previous movies (Elf, Anchorman etc. ), you'll "lap" it up. Hur hur. Testosterone Satisfaction Rating: 1/5 - just fast cars. 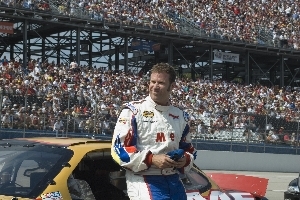 Talladega Nights: The Ballad of Ricky Bobby was released in the UK on 15th September.